Welcome to the April edition of Sarsen Technology’s News Bytes. This month you can find out more about products from Danville, United Electronic Industries and BittWare. You can also read about our sponsorship of Debbie Simpson, who completed the Marathon des Sables on behalf of Facing Africa. Danville’s dspFlash™ SHARC & Blackfin Programmer Deluxe is a production programmer that supports Blackfins and third-generation SHARC DSPs. Thousands of DSP – flash memory configurations are supported, so all you need is a standard Analog Devices JTAG connection on your target. It also includes the ability to load and execute DSP programs independent of flash programming. Files are uploaded to each dspFlash programmer’s internal SDRAM. Since the data now resides in the dspFlash programmer, it doesn’t need to be downloaded each time when programming multiple devices. This product is available to buy direct from the Sarsen website. United Electronic Industries are now shipping production quantites of their new eight-channel 24-bit fully isolated A/D board, for use in their Cube or RACK chassis. Each channel is electrically isolated from all other channels, as well as from the Cube or RACKtangle chassis. In addition to the isolation, each input is overvoltage protected up to ±40V (power on or off). The inputs go into a high impedance mode when power is removed making the AI-218 ideal for use in redundant measurement/control applications. For more information, or a quote, please contact the Sarsen team. The XPort5005 is an XMC module that can be quickly configured to support a platform’s specific I/O or storage needs. As the industry’s first XMC to leverage the widely supported Mini PCI Express I/O and mSATA storage module markets, the XPort5005 offers a flexible solution for meeting current and future platform requirements. The small size of Mini PCI Express and mSATA modules allows the XPort5005 to support up to two full height (F2/H1) and one half-height (H1) module within a single XMC. The XPort5005 supports operational temperatures from -40C to +85C for conduction-cooled applications and -40C to +70C for forced air-cooled applications. 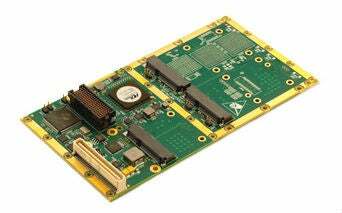 The rugged XPort5005 design also provides for robust mounting of its Mini PCI Express modules, supporting the XPort5005’s use within platforms with the most demanding of environmental requirements, including vehicle transportation, rail transportation, military, and aerospace applications. BittWare’s S5-PCIe-DS (S5PE-DS) is a PCIe x16 card featuring two high-bandwidth, power-efficient Altera Stratix V GX or GS FPGAs. Designed for high-end applications, the S5PE-DS is a flexible and efficient solution for high-performance network processing, signal processing, and data acquisition. The board provides up to 64GB of DDR3 SDRAM as well as options for RLDRAM3 and QDRII+. Providing additional flexibility are four front-panel QSFP+ cages, allowing four 40GigE interfaces (or 16 10GigE), direct to the FPGAs for reduced latency, making it ideal for high frequency trading and networking applications. If you’ve been following our blog over the last few weeks you will have seen our coverage of Debbie Simpson and her incredible achievements in the Marathon des Sables. Sarsen sponsored Debbie in her bid to raise money for local charity Facing Africa, who help provide life-changing surgery for children affected by the disease Noma. Known as the ‘Toughest Footrace on Earth’, the MdS is a brutal six-day adventure across one of the world’s most inhospitable locations – the Sahara desert. You can read Debbie’s Desert Diary on our blog.